Hello. My question is in relation to sizing the exhaust manifold for a 1500cc SOHC motor in a Fiat X1/9. I will summerise the existing engine spec, though some members of the forum may be familiar with it through the SOHC carburation and setting up thread. 2. Lightened flywheel, balanced together with clutch, pulley, crank, and the rod's balanced end to end. 3. Cylinder head has standard valve sizes. 3 angle seat work, and ported/flowed by myself, after some study of Vizard's books, and Guys wise words on this site. 8. The current exahust manifold is 4-1. 31" long primary tubes, of 1 1/4" diameter, into a 1 7/8" inner diameter secondary. Guy, and other members may be familiar with the development work I have done with the current set up. Whist the engine works OK, and is reliable, and produces OK power, there are unresolved issues as to why it isn't producing more torque, and holding on to that torque longer. Eventually I want to build another engine, but before doing so, there are other areas to improve. I have a known quantity in that I know the current power output, and power/torque plots. Using Guy's "one step at a time" approach I want to build a new exhaust manifold and test it to check for improvements / differences to fuelling, and power plots. I have bought a merge collector from the US see the attached pic. It is 1 1/2" inner dia inlets, 1 3/4" inner dia. outlet. 1.) Are these dimentions OK, or would a "transition" from the merge collector outlet from 1 3/4" to 1 7/8" inner diameter (secondary / rest of the system) be better? 2.) The exits of the exhaust ports on the head, are currently circa 30mm dia. There will obviously be a downstream mis match where the head meets the flange, the exhaust flow running into a 38mm dia. primary pipe. I don't expect that this would affect flow from the exhaust, but will it create unwelcome turbulance? 3.) Bearing in mind that sudden changes in exhaust dia. 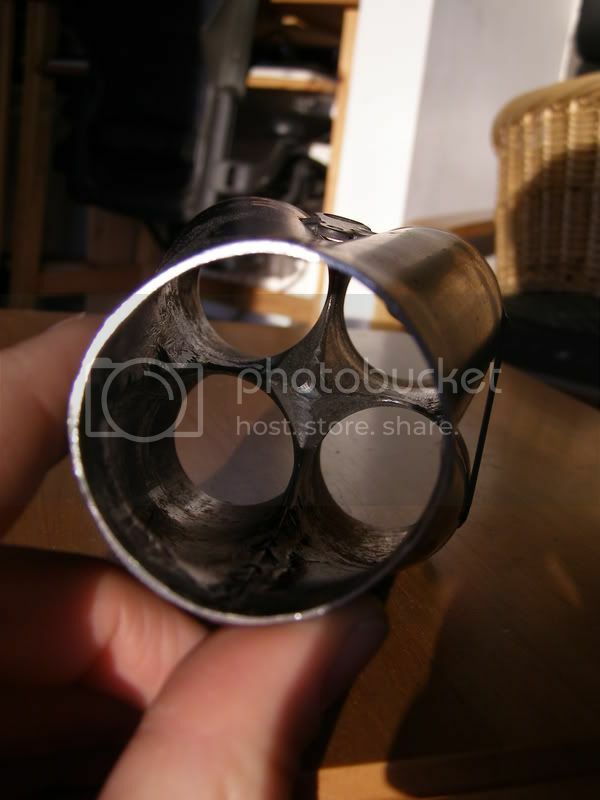 (from primary to secondary pipe) cause pressure waves, which are exploited by primary pipe length tuning, will this mis match cause unwelcome pressure waves at the back of the valve, and should I look to enlage the exhaust port exit to that of the primary pipe? you have caught me out rather because you have started buying parts for a new system already but I shall do my best at this juncture. I must reitierate, as I tell people frequently in conversation, that access to simulation and accurate dyno data is essential to optimise a system, and whilst the bulk of what I wrote in the 90s about header layouts still holds true I know know that the perfect system is only as good as the last dyno test. Which is by way of saying that each week brings a new configuration and whilst one can assume that system X may work quite well on engine Y there is often no way of knowing how perfect it is. One thing is indisputable however and at complete variance with anything known even 5 years ago never mind 20, and that is that 4-2-1 on a cylinder inline engine gives a 'fuller' (more driveable - and I don't mean for going shopping..) torque curve than 4-1. You may take that as fact, even if both systems show the same peak power or the 4-1 slightly more. The 4-2-1 - if right for the engine - will always be better. Below is as close to an optimum as I can give you for an X19 of around 1500. It was derived by analysis and proved out on dyno test and just today forwarded to me by member Steve Sharpe (who has a GC spec X19 inj nearly ready to go for setting up). You can ignore that the engine in this case is 1600cc. It's not so critical that anybody would waste time simluating to find out what difference it made. Your inlet chord lengths are not going to be exactly the same as that engine (pic below). Same applies and so on, cam type, timing etc. Now you have chosen to run a 4-1 so you need the same py length as combined lengths of the 4-2-1 ie: 28 + 12-14" = 40 - 42". You have shown that it is possible to run a system way shorter (even shorter that you now have) and the motor will run fine and doubtless be better than now - it should certainly be different and I hope you notice a beneficial difference. The stated 'optimum' above ties in well with your new collector, 1.5" internal diameter at entry, and as for your mismatch - I do consider having the primary pipe bigger than the port (and valve throat) to be a 'good thing', and most systems Dr K I and I have discussed have this divergence to some extent or other. Do not enlarge your port to the size of the primary. To be honest it's based on no more than experience, neither of us is entirely sure why. Might be some small wave action, might be gas related (anti reversionary), dunno..
Simulation called for 2" ID (two inch) on a Fiat Fire engine 1108cc, but don't take that to mean it will always be true. It won't. There is no way (not here anyway) of perfecting the primary pipe ID. Just follow my rule of thumb. Now, importantly, and regarding pressure waves. The critical wave - ie: the one we're trying to tune the primary pipe to and certainly insofar as your proposed 4-1 is concerned is the reflected wave that comes back up the primary when the outgoing ex pressure pulse meets the enlargement at the collector. The collector itself is ignored in the pipe length - the pipe length is the chord length (ie along the pipe center axis) measure from the HEAD FACE to the end of the circular pipe section at the collector - usually just inside it. The pressure wave is reflected up its pipe from that open volume inside the collector cone as a negative wave - and, as most regular readers of GC Q&A will know, it goes into the cylinder and not only aids scavenging of residuals but lowers the cylinder pressure to encourage fresh_charge_in. I want to mention this. Far too many people, despite the lengths I go to here and on the telehone/email, still treat the header as some rather insignificant add-on that simply must be bought off the shelf for convenience. Despite that they may have spent a great deal of money on the head, pistons etc. And there are some dire header examples around, clearly made by people whose primary objective is 'moving metal' and taking money and not supplying a proven quality product. The header is a as critical as any other power-producing part of the engine. The only item I have bought so far is the 4-1 collector, so all other factors are changable. Now that I know that a 4-2-1 system IS better, I think I will have to change the design to suit. If sticking with a 4-1 system, 40" - 42" are massive, but I can accomodate that as well. I will be starting to build the system soon, so will post some pics, and hopefully dyno results in a couple of months. Not only would this make good sense from a tuning perspective it would be a model of how to determine the optimum, something often talked about but rarely undertaken in practice. It will also prevent me from looking a complete 'banana' if the one I have suggested is no better than your 4-1..
Well I suppose there we have hit on the problem with making an exhaust manifold. As you say, and I have learned, ONLY a system that has been run up on a specific engine, and dyno proven to have the optimum primary and secondary lengths can be considered the "right" one. Change any other aspect of the engine, ie cam, or compression ratio, or inlet length, ram pipe etc, (which I inevitably will want to do as the engine, fuelling, etc. evolves) and the optimum may change. Again as you have pointed out, expensive computer software can work out a ball park but....... I presume this is why it is so rarely done. The time and expense involved to do it properly is prohibitive. For myself, I know that my welding skills, time and finances are not in a postion to do this. Which I suppose begs the question; Then why bother? I may get it wrong, I don't know if I could do better with a slightly different lengths. Good point, and one only countered by saying, I am making an educated guess. Educated by the priceless experience of experts. I'll start long, then go short if its no good. (easier to cut than to weld) Hopefully I will be able to provide some feedback for your other members in return for the information you have provided. You're right on the money James, well done. I'm still designing my manifold, and system. The ideal, is being complicated by the constraints of the cylinder head being a reverse flow design. The inlets and outlets are quite close, and restrict pipe angles. There is also the proximity of the waterpump, and feed pipe, also the driveshafts and chassis cross member to consider. Anyway, I have come up with an equal length design, (not quite perfected but easily adapted) However I am a little concerned over the amount of bends in the pipework. I am assuming that despite the disparity of bends between cylinder 1 primary and cyl 4 primary, the heat and pressures will be broadly similar. Hence local speed of sound will be the same. Ergo the pressure wave produced by the same tuned lengths, will travel at the same speed, whatever the amount of bends. Is this correct? If not, will it be so different that it matters? I am also assuming that gas velocity will be lost, but if the system outflows the head is this a problem either? To illustrate what I am refering to, I have scanned in some sketches, and design. The design refers to the Centreline of the pipework. All bends are 2.5" CLR, though the ones coming direct from the head, and then bringing the pipes horizontal again are 1.5" CLR, in order to fit around the carburettors and inlet manifold. The picture is a plan view of the manifold, which will sit horizontally in the car. The blue lines are the top pipes, with the red cyl 2 + 3 below. No 2 cyl. pipework will further be angled downwards to clear cyl 3 pipe. All pipes will converge to be bunched conventionally in a square pattern. Although the car currently uses DCNF downdrafts, I will look to use a side draft (injection) set up at some stage, so the design has taken that into account. Lengths will all be 710mm or 28"
Sketch of pipework as it leaves the head. 1. 28" is way_too_short on a 4-1. Why so short? We've been thru this (above). 2. The optimum r/d (chord radius/pipe ID) is 2.0 or higher. I know this from flow tests. The lower the r/d value the greater the flow loss. Your biggest bend is only 2.5"/1.5" = r/d of 1.7 - a bit borderline. The reason for the flow losses is the adverse pressure gradient that can develop in a bend due to the varying velocities around the curve. In the outer region of a pipe bend the pressure in a fluid rises and on the inside curve it drops, generating an adverse pressure gradient. It's a bit like SSR flow. When you have an adverse pressure gradient on a curve you get turbulence and separation and flow loss. Conversely with generous bends the flow loss will be negligible. Thanks for the reply. The 28" or 710mm long bit is the primary length, there will still be secondarys of 12 - 14" to go on, otherwise the primary length for a 4 - 1 system would be, as discussed 40 - 42" long. I haven't shown the secondaries in the diagram. 1.) Will this flow loss measureably cut power, IF the exhaust out flows the head in the first place? 2.) If it does, Will increasing the primary pipe diameter counteract this? 1. Yes I guess it will although I have never done a dyno test of that particular thing. In saying this we all know that sometimes the architecture of the engine bay forces the use of non-optimised bends. 2. No, increasing the pipe dia will make it worse, because it will reduce the r/d ratio (radius/pipe internal dia). The bigger the pipe the bigger bend it needs. Thanks for the note on lengths, clear now, 4-2-1. OK thanks. I'm assuming then, that a system with many bends, will not neccesarily mean a loss in flow, as long as the inner radius is 2" or greater. Or put another way. A system that has few, but tight bends. (2" or less inner radius) May offer less flow than a more elaborate design, that has more gradual bends? Quite right, and skilled fabricators of the best exhausts will go to great lengths to develop large radius bends within even very confined spaces. After a long wait, here is the new exhaust manifold and system. As discussed above, it is an “equal length” 4-2-1 system running 28” primary pipes 1.5”OD. 13” ish Secondary pipes 1.75”OD. The final pipe is 2”OD. All of the bends have a 2.5” or greater inner radius, with the exception of the bends that exit from the head which have a 1.5” inner radius (2.25” centre line radius) Due to being able to fit (in the future) a side draft inlet manifold. The design is my own, and as such, needed to fulfil requirements for existing, and future induction set ups. Other factors were decent flow with large radius bends, and being relatively easy to construct. I have welded it all up with a “Mini MIG”. I am not a proficient welder, and have only done car body work before. Most advice will be to use a TIG welder, however they are a lot of money, and unless I planned to construct several manifolds, etc, not cost effective. 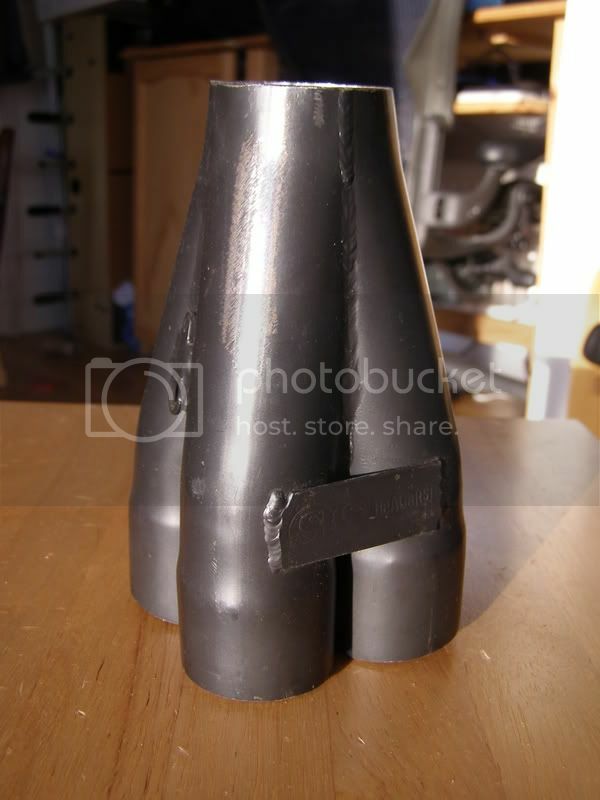 Anyway, as you can see by my photos the early (in the project) welds were not pretty, but they have good penetration, and are gas tight. I got much better as I progressed with the project, finally understanding WHY I was getting a good weld....or bad, and being able to adjust the machine or my plan of attack. The MIG wire used was Stainless 308L, and pure Argon disposable gas bottles available from Halfords. I gather that Argoshield Light is the preferred gas from BOC. One thing that I really struggled with though was welding to the stainless steel flange that I had made up. It was a really nice laser cut effort. Unfortunately, Stainless steel retains heat much more than mild Steel, and as such, short welds are preferable otherwise you can end up distorting the work. Which is exactly, what I did. Warped flanges are useless when mounting to the Head, especially when you have to bolt up the exhaust and inlet manifolds to the same studs. I spent a few hours filing them flat again, after first attempting to heat and cool them back into shape. The result is a good seal. I have kept the same factory flange thicknesses on the stud mounts. 11mm and 26mm. I can bolt up either the standard inlet manifold, or my DCNF downdraft manifolds, or my side draft item with this exhaust system. I have put the silencer near the engine top cross member because I can support it well there, using existing brackets. I have mounted it all to the engine, so there will be as little strain on the manifold studs as possible, ensuring engine movement does not break the system or the seals etc. If I needed to put DCOE side draft carburettors on, then this would obviously not be ideal. There is just enough space to squeeze it next to the rear valance if required. Thanks for sharing it with us. The shift and reduction of resonance is a very good sign. Very nice job is it built as per the earlier jpg drawings or do you have any from the final build also how much did it cost you and where did you get the pipe from, I have a 1500X1/9 as well and cannot find a good manifold so i might go down the same route as you.